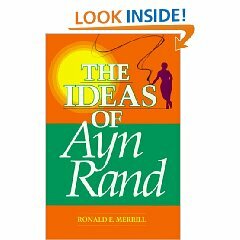 On my shelf for several years, I recently read Ron Merrill’s book, The Ideas of Ayn Rand . I walked away with one key insight. Most of the book is a rehash of her history and her philosophical work. It doesn’t hurt to refresh yourself on important ideas, but I don’t feel like I learned much from this part of the book. I’ve read all of non-fiction from her and I’ve read Barbara Branden’s biography. Merrill has a different perspective having been peripheral to the core group in the 1960s. What I found fascinating was the last part of the book where he analyzes the current state of the “movement” and how it could improve. His advice seems to be a sketch of what Stefan Molyneux is almost over-explaining over at Free Domain Radio. That is, find the people who you agree with on the basics (metaphysics, epistemology, …) and tolerate your differences with the benevolent assumption that one of you errs on the facts not that by corruption. This book was published in 1991. It was a big deal then that David Kelley had been pushed out of the “orthodox” circle of Objectivists. That was a strange experience for me having just recently begun studying Objectivism seriously. Merrill argues that our focus for change must be cultural not political. I’ve been listening to Molyneux’s work during my commute, and he definitively destroys the notion that “working within the system” is a viable option. Neither through electing like-minded politicians nor through academia can we expect to avert our world’s crash course. The most powerful tool we have is the power over ourselves. If we live morally, we will prosper and by that prosperity inspire others. What I appreciated most from Merrill’s book was the reminder that evil’s power is given by sanction of the victim. I cannot count the times when faced with some frustrating injustice (big or small), I find it started with tolerance for injustice. I don’t have the context to understand whether Merrill was influential over the ARI, but they certainly have oriented themselves on cultural change, and to great success. At under 200 pages, this book is an enjoyable reminder of that things are better than they were and a fresh reminder to shrug off despair.